Good morning, and Happy Tuesday!! 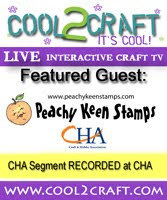 It's time for another Peachy Keen Challenge, and this week our challenge is a Halloween card using at least one pumpkin, the color purple, and something zig-zag. Here's my take, and I do hope you like it! First of all, I LOVE Halloween. Now, don't get me wrong, because I don't love all the "bad" stuff associated with this day, but I love the season, I love the decorations, I love seeing the kids all dressed up and excited about the whole event. I always look forward to making a couple of big pots of soup, and having my family stop by the house with their little ones at some point during their busy evening for a bowl of soup, and some Halloween treats to sustain them through their trek for the night. Now that I've shared why I enjoy this holiday so much, I guess I'd better get on with the card!! I have to say that the zig-zag had me a little worried this time, because I just couldn't figure out what I was going to use, then inspiration hit me when I was visiting Kadie and Mary's blogs. They always do the most wonderful stitching on their cards, and it truly does inspire me, but also intimidates me a little. I didn't realize until a few weeks ago that all Kadie's stitching is done by hand! Whoa!! You really need to go check out her work!! Then Mary sent me the most gorgeous card with stitching that was so amazing. She stitched the half circle with tiny little stitches, each one perfect alignment, and once again inspiration hit me!! Check out my card from Mary here. Anyway, I decided I would give the handstitching a try on this card. I pierced the holes first, and then added the zig-zag in with embroidery floss. I'm okay with how it turned out, but I could use a bit more practice. I will agree with Mary, when she said that it's relaxing doing the handstitching. It really was. At any rate, suffice is to say that I thoroughly enjoyed this challege, and I may use it to make many, many, more Halloween cards. Be sure to play along with us this week, because I can't wait to see where inspiration takes you!! I know some of my favorite sisters are playing along this week, and I'm on pins and needles to see what they come up with!! I hope you are having a glorious Tuesday, and thanks for stopping by. May God bless and keep you today and always! OMG! this card is fabulous! I just your coloring..the pumpkin just pops off the card! You need to post a video on your coloring technique!!!! You are fantatic at it! WOW this is so cute Lorie! Amazing coloring job as usual!! Seriously Lorie - we're not worthy of your talents!! I'm soooo glad you said you've been painting pumpkins for years, because it makes me not feel so bad because your coloring is PHENOMENAL!!!!!!!!!!! (I might have spelt that wrong, but you get the point!) I really do want lessons from you Lorie! Can't wait to play this challenge either! This card is THE Cutest!! I need that stamp! Beautiful job with the stitching, Lorie...the perfect touch to this adorable card. Love ya! what a fabulous card! your coloring is just awesome and that stitching! holy moly! Are you KIDDING me! This is just the absolute cutest Halloween card. You are soooo sweet and so talented Lorie. I LOVE the stitching you did. It compliment sthe card perfectly. Guess what? I got my PK stamps a couple of days ago and two of them were Halloween. I can't wait to play. I left a little something for you on my blog. Girl this card is gorgeous, the image, the coloring the stitching are all fabulous. Lorie, this is super adorable :) I'm with you on H'ween and the adorable parts of the Holiday, but not so much the scary/bad ones! This is divine -- so cute in so many ways! Another beautiful card!! Your coloring is out of this world!! I love how you added the hand stitching too! Lorie, your card is my favorite from the DT this week! Adorable, love the image,papers, and everything about it! How cute is this? I am loving all the extras and the shading in your coloring is to die for! I keep going back to look at this card. I tried to leave you a comment before but the Blogger was acting up. You did such an awesome job putting the colors together...LOVE IT LOVE IT LOVE IT! I just wish I could color as good as you. I keep begging Kathy to teach me..to bad I am states away!